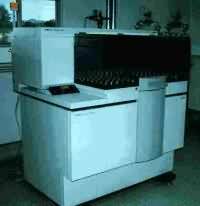 - Determination of major and minor elements by XRF and ICP-AES. In addition to these facilities the Laboratory complex also houses two specialist laboratories, one for the testing of Industrial Minerals and another for engineering geological tests. The sub-division handles enquiries from a variety of sources, including general public and the Namibian Police and Custom, giving advice on rock and mineral identification and sample assay. Tin- and Tantalum-bearing concentrates are routinely analysed for the Small Miners Assistance Center, forming a part of their efforts to improve the socio-economic climate of the Uis area. Last year the GSN took delivery of a Philips 2404 X-Ray Fluorescence (XRF) Spectrometer. This instrument, together with automatic fusion and palletising sample preparation apparatus, comprise a major capital development project (N$1.5m) funded by the Namibian Government. 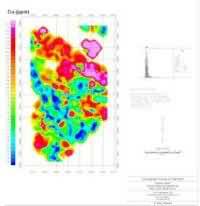 The XRF will enable the GSN to produce high quality major and trace element data on a variety of geological materials for program within the Ministry of Mines and Energy, as well as for the private sector. Mineral identification is an essential requirement for the GSN, particularly for the testing and evaluation of industrial minerals. Replacement of the GSN's ageing X-Ray diffractometer was made possible through SYSMIN funds in an extension to the Industrial Minerals Project. The equipment is now fully installed and functional. Progress on pilot studies for regional geochemical surveys has been rather disappointing. These surveys are a new endeavour at the Geological Survey and are labour intensive. Unfortunately, in the present economic climate the GSN is unable to recruit the personnel required to carry out the sampling needed. Efforts have been made to secure funding to contract-out sample collection, but at this time it is not known whether these have been successful. Capture of older archive data on open file is, however, ongoing. Manipulation of these data and the generation of maps have been greatly assisted by training under the auspices of the GEODESA Project.